Charlie Redman, a BSc Architecture student at UCL's Bartlett School of Architecture, has been shortlisted for this year's AJ Small Projects Awards for his student project, 'Welcoming Shelter'. 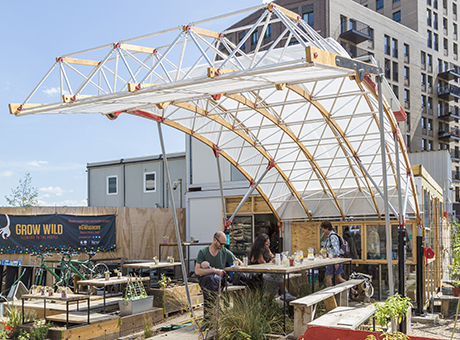 Developed as part of Charlie's BSc Architecture Part I at The Bartlett, Welcoming Shelter is a kinetic structure providing a flexible outdoor dining space at the King's Cross Skip Garden in London. The shelter was designed to be moveable so the garden can be relocated to different spaces around Argent’s development site as construction of the huge masterplan progresses. The AJ Small Projects Awards celebrate completed projects with a contract value of £250,000 and under. The winners will be announced on 2 March 2016 at New London Architecture (NLA) and all 25 shortlisted projects will be exhibited at the NLA throughout March.